Fronius Cold Metal Transfer — Lean Machine Metal Fabrication Inc. The only welding machines we use at Lean Machine are all from the Austrian company Fronius. For our MIG welding, we use both the Fronius TPS and CMT machines. Our goal is to give our customers more accurate parts. Accuracy can be tough to maintain when a part is put through a welding process. The Fronius TPS (Trans Pulse Synergic) machines are very good to weld all materials with their special 4 step process of gas pre-flow, hot start, pulsed main current, and crater fill. The CMT (Cold Metal Transfer) machines are a step up on material thickness under 1/4" since they actually shut the weld arc off between main current wire feed pulses. 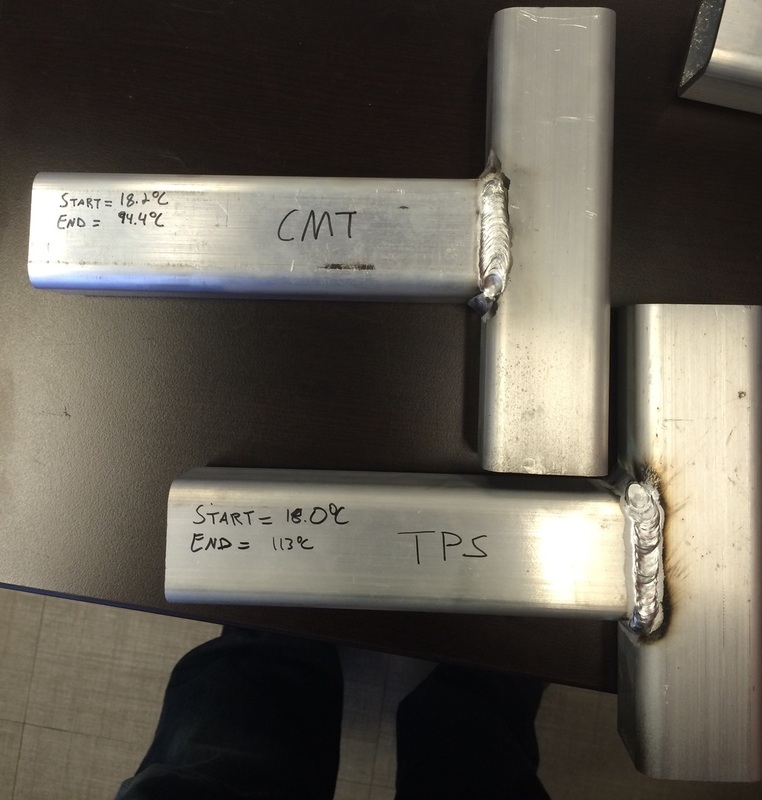 The CMT process adds less heat into the material, which results in less weld distortion in the part. This is great technical jargon but the proof is in the results. As you can see in the picture, on a 2x2x1/8 6061 aluminum tube joint welded with both the TPS and CMT processes the overall temperature is an average of 18degC cooler when welded with the same procedure over the same time period. These results were repeated 3 times to ensure accuracy. The tube joint was also cut open to check penetration.